Shulamith Muller (nee Movshowitz) was born in Pretoria in December 1922. She studied law at the University of Pretoria, and was admitted as an attorney in 1948. She joined the South African Communist Party (SACP) in the early 1940s and was “listed” as a Communist by the apartheid regime in 1951, appearing on The List at No. 208. 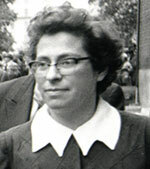 She married fellow Communist Party member, and trade unionist, Mike Muller in 1943.